Our 2010 visit to Hong Kong Island starts in Central on the busy Des Voeux Road, with not only the buses, but the traditional double decker Hong Kong trams. Not far from here is the relatively new Central Bus Station – adjacent to the Star Ferry terminal where our cameras take up their position to film the action. A number of the open top services provided by New World First Bus in the shape of the ‘Rickshaw’ tour are featured as well as former NWFB Dennis Condors with the ‘Big Bus Company’. Exchange Square Bus Station is our next visit with buses mostly from the Citybus fleet filmed arriving and leaving. Connaught Road in Central is the next location where buses from all three major fleets are filmed. We return to Des Voeux Road, this time at Sheung Wan to record the action of the buses and the trams. Just along the water front from here is the Macau Ferry Bus Station where we stop for a while. There is more tram action observed when we take up filming on the junction of Whitty Street and Des Voeux Road at Shek Tong Tsui. Many different advertising liveries are seen on the trams – a few featuring Christmas which was just a few weeks away. We move our cameras to the eastern side of the Hong Kong Island, where we film at the Island Resort area at Siu Sai Wan with all three fleets represented and providing plenty of action. We stay in the area and capture the buses on Siu Sai Wan Road and Fu Yee Road junction and then onto Siu Sai Wan. The next stop is Shau Kei Wan where both the buses and the trams fill the streets – lots of action for you to enjoy. As we head back towards Central we film at Fortress Hill, Causeway Bay and Wan Chai. At Central we catch a tram to Western Market and back to Pedder Street where we can observe the action from the top of these fantastic vehicles. Changing our mode of transport we take a ride on a new Citybus Enviro400, 7001 (PH 4891) on route 260 to Stanley. It is quite some years since Citybus ran 2-axle buses, the last ones being former Singapore Leyland Atlanteans! 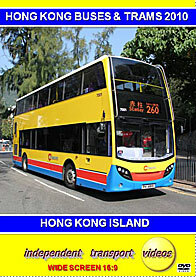 This vehicle is currently being evaluated by Citybus, like KMB they are also trying one out and this can be sampled on our ‘Hong Kong Buses & Trams 2010 – Kowloon’ programme that is now available. We film mostly Citybus in action at Stanley before our next location – Aberdeen. Situated on the south of the Island this bustling town is home to large numbers of NWFB and Citybus buses with a few KMB vehicles just for good measure! Our final scenes on this programme are back at Causeway Bay, but this time at night to capture the atmosphere and sights of this busy Island.